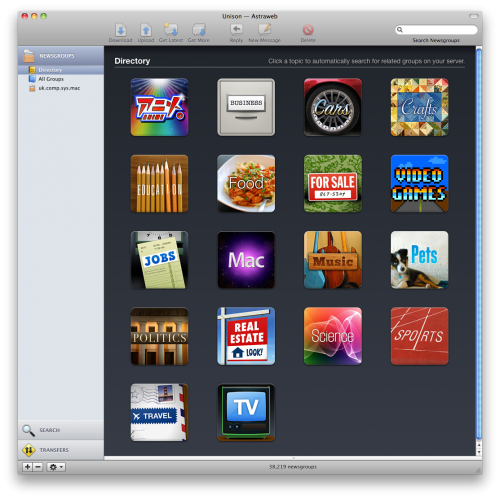 When I moved to the Mac platform a few years ago one area of software that wasn’t well supported was newsgroup readers. There was a few but the one that stood out was Unison from Panic Software. Early in January they announced Unison 2 and I was surprised – what could they really do to justify an upgrade? The first aspect they have addressed is making the textual world of newsgroups far more visual. Instead of seeing 1000’s of groups to browse with you can select a group o groups via the Directory. This then lists all music groups for example or all Mac groups. You can then a select a group and Unison will download the latest headers for you to browse and read. You can also subscribe to a group and each time you launch Unison it will update the groups with the latest content. You can also use All Groups to step through the different groups available or just use the search facility. Type in a search string and all groups that match the string will be returned. Easy and fast. 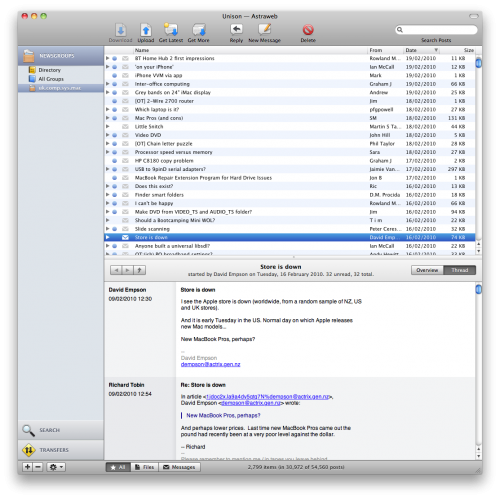 Newsgroups are really just lots of text messages but have been used for years to carry binary files as well. If you want to use newsgroups as a messaging platform then Unison helps with good support for threaded messages, messages updated on launching the app and a clean, clear interface. You can also reply in HTML (boo) or plain text (yah!) to messages so all formatting options should be covered. Despite the nice messaging features most people will want to download from binary groups and Unison 2 has some nice upgrades in that area. First of all, browsing group messages will actually display pictures and music files directly in Unison rather than seeing 10’s or 100’s of text messages. You can even play the music from within Unison but to be honest this isn’t the best way of using Unison. It supports NZB files which makes downloading files as easy as using a search engine. 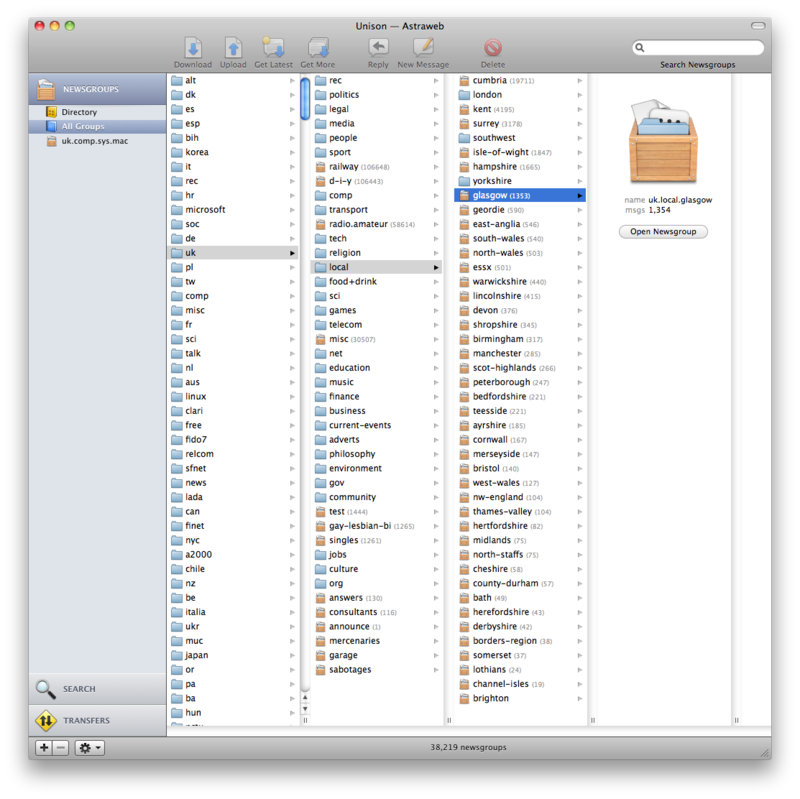 NZB is an xml based file that groups together message ID’s for a particular file or set of files. 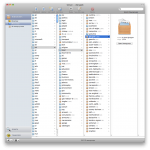 So if I wanted to download the latest episode of Lost, instead of searching for and selecting 1000’s of messages I search for and download one NZB file which unison use’s to grab the correct messages. Once the messages have been downloaded, Unison 2 will now extract the files, use PAR files to repair any broken files and then clean up the PAR and ZIP/RAR files when the file has been extracted. No need for any helper app’s as Unison does it all. 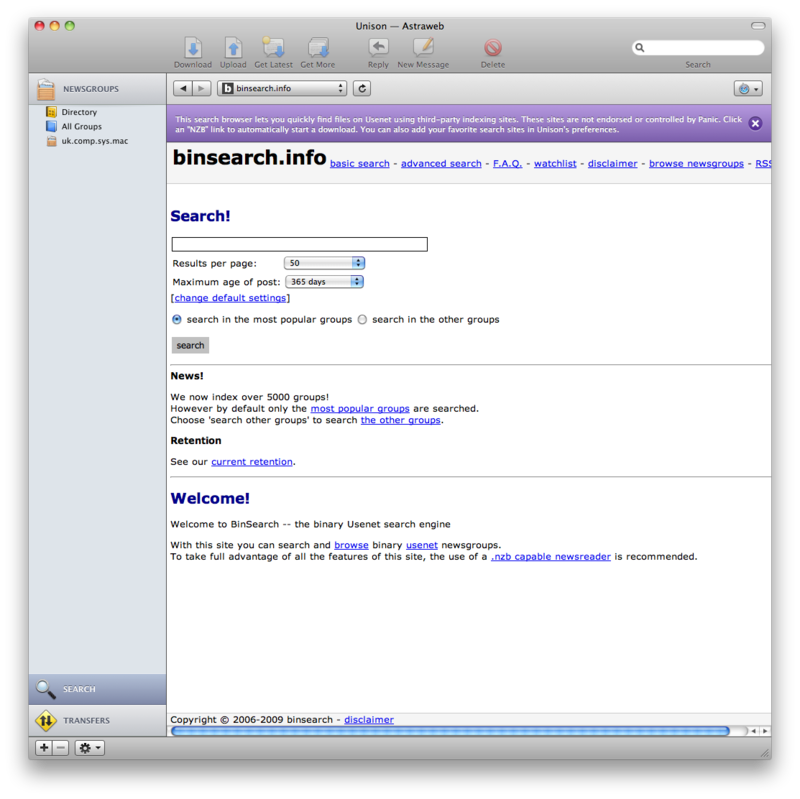 Another new feature is the Search Browser which connects to popular NZB search engines and allows you to search and download NXB files form within Unison rather than an external browser or search tool. You can customise the search engines used so if you have a favourite site or paid for access to one of the private search engines then you can use it as well. In use I’ve found it to be fast and reliable and the new features have really added to the usability of the application. Unison 2 costs $29 for one licence or $18 for an upgrade form version 1. I think that’s a bargain for the functionality you get in return. If you are a heavy binary newsgroup user then another option is SABnzdb which is a cross platform binary newsgroup reader that doesn’t have a GUI but once setup is very powerful and offers a number of scriptable and customisable features but for my occasional toe dipping into newsgroups, Unison 2 is my tool of choice.